It is my great pleasure to introduce our colleagues at the Institute of Geography, Faculty of Science, Pavol Jozef Šafárik University in Košice, Slovakia as the GeoForAll lab of the month. I would like to thank Dr.Michal Gallay for providing me all background information on the lab activities. The Institute was established in 1998 and it is located in Košice – the second biggest city in Slovakia. Their research and education is organized by three research groups: Physical Geography, Human Geography and Regional Geography, and Geographic Information Science. The list of projects and publications provides an overview of their research is at http://geografia.science.upjs.sk/index.php/en/research . Currently, the Institute is led by Prof. Jaroslav Hofierka, who is the director and a professor in Geoinformatics. He specialises on developing methods for multivariate environmental modelling and spatial analysis of environmental phenomena in the open-source GRASS GIS. Recently, their GIS group (http://geo.ics.upjs.sk/index.php/en/institute/structure-of-institute/oddelenie-geoinformatiky) has focused on 3D applications of combined use of terrestrial and airborne laser scanning in speleology and karst geomorphology (http://spatial3d.science.upjs.sk/), which relates to optimization of processing and analysing big spatial data by the means of distributed computing. The findings improved the understanding of morphogenesis of the Domica cave by the means of 3D geomorphometry, assessing the photovoltaic potential in urban landscape also on buildings facades as 3D vector data. Some new methods of modelling the DEM surface, water flow and solar irradiation by parallelized modules in the GRASS GIS and the OpenMP library are currently under review. The most recent research initiatives specialise on spaceborne and UAV-based remote sensing. The feasibility study for the European Space Agency looks at the suitability of the Sentinel 2 multispectral imagery for ascertaining solar transmittance of urban greenery (http://esa-surge.science.upjs.sk/). The project SEGMENT, with the partners from Comenius University in Bratislava, searches for new methods for land surface segmentation from microscale level to coarser level. High-resolution mapping with UAV and terrestrial lidar is the core method of data collection in this project. Their research is closely integrated with teaching. Currently, they are running single Geography programme and Geography combined with another discipline in Bachelor level. The Master level offers two single degrees: (i) Geography and Geoinformatics and (ii) Geography with another discipline for teaching at primary and secondary schools. Since September 2017, they started the first year of a doctoral programme in Geoinformatics and Remote Sensing as the only institution in Slovakia. The PhD. programme is also open for anyone interested from abroad speaking good English (http://geo.ics.upjs.sk/index.php/en/study/doktorandske-studium-phd ). The students employ their geospatial competences in other classes of partial disciplines in Physical Geography and Human Geography. All GIS courses are provided in English for incoming ERASMUS+ students, the list can be found at http://geografia.science.upjs.sk/index.php/en/study/erasmus . The stated software, but also the hardware and geodata infrastructure are concentrated in two laboratories: the Laboratory of GIS and the Laboratory of Remote Sensing (http://geo.ics.upjs.sk/index.php/en/institute/laboratory). From the international point of view, two items have recently expanded the standard geospatial infrastructure that makes the labs unique. 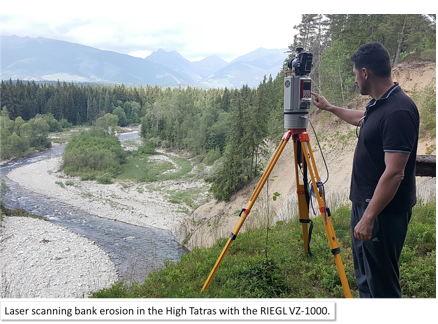 It is the Riegl VZ-1000 terrestrial laser scanner capable of online full-waveform processing up to 1400 meters and 550 kHz measurement rate. They are using it now for acquiring time-series of 3-D vegetation for ground truthing the solar transmittance derived from Sentinel 2 imagery in the project for ESA. The second item is a custom integration of the state-of-the-art technologies within an UAV platform capable of high-resolution and high-accuracy laser scanning, hyperspectral imaging, and photographic imaging. The technological solution comprises the latest development of a completely autonomous, unmanned helicopter by Aeroscout, the Scout B1-100 UAV helicopter that provides a payload capacity of up to 30 kg. Production of the UAV system and payload integration was financed within the project of University Science Park TECHNICOM co-funded by the European Union Structural Funds and the Ministry of Education, Science, Research and Sport of the Slovak Republic. More details are summarized in this ISPRS Archives paper (https://www.int-arch-photogramm-remote-sens-spatial-inf-sci.net/XLI-B1/823/2016/ ). They invite all interested researchers to contact them and in order to collaborate and use this specific equipment. I want to thank Jaro Hofierka and all colleagues and students at Pavol Jozef Šafárik University for their contributions to the GeoForAll initiative . We are looking forward to working and building more collaborations with all interested on this education mission.